The Santa Cruz de San Sabá Mission, built in 1757, is the only Spanish mission in Texas destroyed by Native Americans. The destruction was so complete that it took 235 years for archeologists to finally confirm the site on the banks of the San Sabá River about 120 miles northwest of San Antonio. Franciscan padres in San Antonio dreamed of constructing a mission in Apache territory and putting an end to almost perpetual warfare with the tribes. In addition to converting the Indians, reports of silver and gold deposits encouraged ideas of developing mines, building villages, and using the Indians as laborers. The Apaches came to a peace ceremony in 1749 and asked the Franciscans to construct a mission in Apacheria. The tribes wanted Spanish protection from their mortal enemies, the Comanches, and other northern Indians. The Padres and Spanish officials, believing that the tribes wanted to be converted, struck out on three expeditions into Apache Territory looking for a suitable site. The San Sabá River valley offered the potential for irrigation farming. Always worried about the cost of every endeavor in its Texas province, Spanish officials finally authorized the new endeavor after three other missions closed and their religious ornaments and furnishings became available. The final incentive came with an offer from a wealthy owner of Mexican silver mines who agreed to fund the cost of up to twenty missionaries for three years providing that his cousin Fray Alonso Giraldo de Terreros be placed in charge of the enterprise. Col. Diego Oritz Parrilla was appointed commander of the San Sabá presidio, and the march to the new site began on April 5, 1757. About 300, including 100 soldiers and six missionaries, arrived on April 17 with 1,400 cattle and 700 sheep. To their dismay they found no Apaches waiting to join the mission. The Padres, concerned about soldiers molesting Indian women at the East Texas missions, convinced Commander Ortiz to build the Presidio on the opposite side of the river and about four miles from the mission–– a fine distance for keeping soldiers away from to the Indian neophytes, but not so handy for protecting the mission. By mid-June, not a single Indian had come to the mission. Then, to the Padres’ delight 3,000 Apaches who were heading north to hunt buffalo and fight Comanches, camped near the mission. The Indians ignored the missionaries’ overtures, but when they departed, they left behind two of their group who were sick and promised that upon their return they would join the mission. By this time, three of the original six missionaries had given up and returned to San Antonio. With the arrival of winter, rumors circulated of northern tribes gathering to fight the Apaches and destroy the mission. The Padres did not understand that despite Apaches having never entered the mission, it appeared to many tribes, including the Comanches, that the Spanish were siding with their bitter enemies. On February 25, 1758, Indians stole fifty-nine horses, and Parrilla Ortiz led soldiers in pursuit, only to discover hostile Indians all over the countryside. 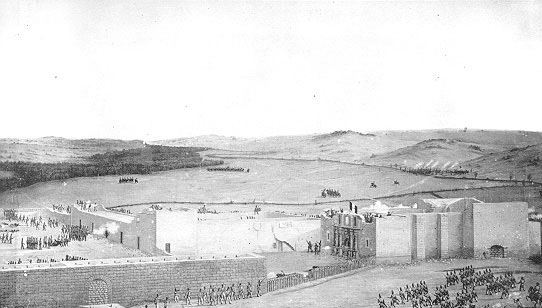 Ortiz retreated to the mission and tried unsuccessfully to convince Father Terreros to move the remaining three missionaries and thirty-three others to refuge in the Presidio. On March 16 as the mission went about its morning routine, 2,000 members of tribes that may have come from as far away as Louisiana, managed to enter the compound and despite attempts to appease them with tobacco, trinkets, and finally horses the slaughter began. Many of the Indians used European guns at a time when most Indians fought with bows and arrows or hatchets. Father Terreros and seven others were killed, while one missionary and about twenty occupants escaped to the Presidio. The attackers killed almost all the animals, including the cattle, and set fire to the stockade. The Indians moved on to the Presidio but when they could not lure the soldiers outside the fortress, they departed on March 18. After less than one year, the Santa Cruz de San Sabá Mission had come to an end. 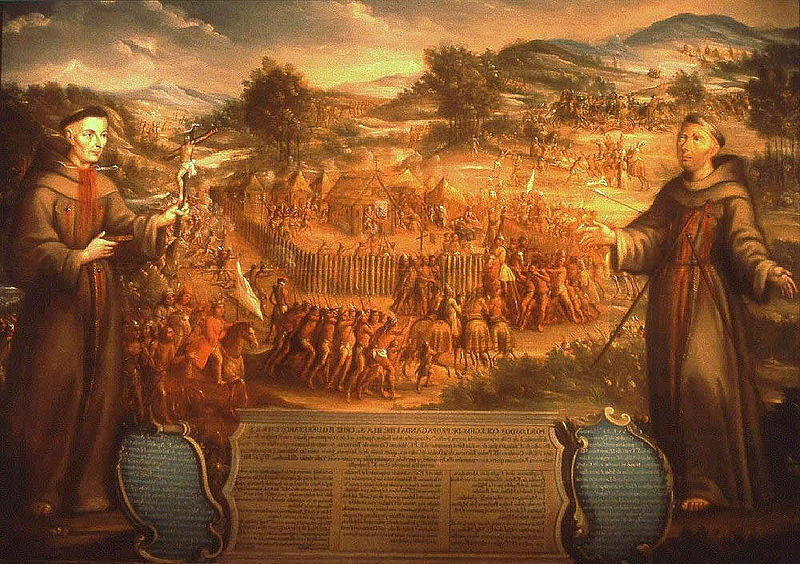 The following year in September, Ortiz Parrilla led 600 soldiers and Apaches in a failed attempt to punish the warriors for the attack on the mission. They were discovered before they reached a Wichita village on the Red River and endured heavy losses––fifty-two dead, wounded, or deserted––before Ortiz ordered a retreat. The Spanish government insisted that the San Sabá Presidio remain open despite the superior power of the plains tribes. Many soldiers asked to be transferred and despite the Presidio being rebuilt in limestone and surrounded by a moat, the soldiers faced death if they ventured out of the compound. In 1762 a mural, The Destruction of Mission San Sabá, believed to be the first painting to depict a historical event in Texas, was commissioned by the wealthy miner who had funded the endeavor. It is believed the unsigned work was done by Jose de Perez who relied on accounts of firsthand witnesses. In 1769, Presidio San Sabá was finally closed, over ten years after the fall of the mission it had been built to protect. An added footnote: Soon after James Bowie of later Alamo fame married the daughter of a wealthy Spaniard living in San Antonio, Bowie made two unsuccessful expeditions in search of the Lost San Saba mine. Not to be deterred by Bowie’s failure, stories have continued to appear in newspaper accounts all over the country of miners who are sure they have found the site of the vast Spanish gold mine. granddaughter of Lorenzo de Zavala, the first Vice President of the Republic of Texas, was a schoolteacher, a prolific writer of Texas history, and an early advocate of restoration of the missions in San Antonio and other historic structures. About 1889 she organized the “De Zavala Daughters,” dedicated to preserving Texas history, which soon became a chapter of the Daughters of the Republic of Texas (DRT). 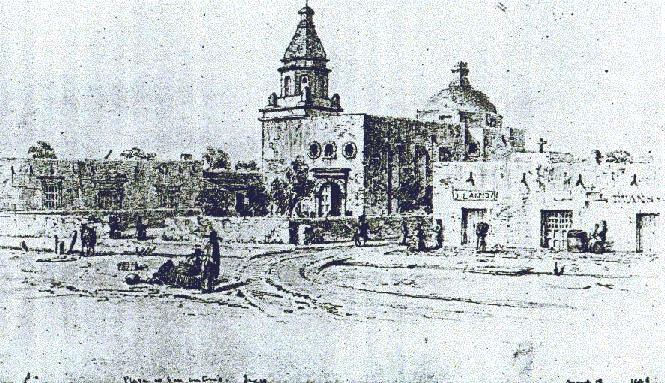 Although the state of Texas purchased the main entrance known as the Alamo chapel from the Catholic Church in 1883, the state did nothing to preserve the structure. The building north of the chapel, which De Zavala and her friends believed had served as the convent when the complex was a Spanish mission and was the long barracks where most of the fighting occurred during the battle, had been sold to a wholesale grocer who added a two-story building and altered the façade. Adina De Zavala and her group secured an agreement from the grocer to have first option to purchase the long barracks, which they dreamed of restoring to its former appearance as a museum. 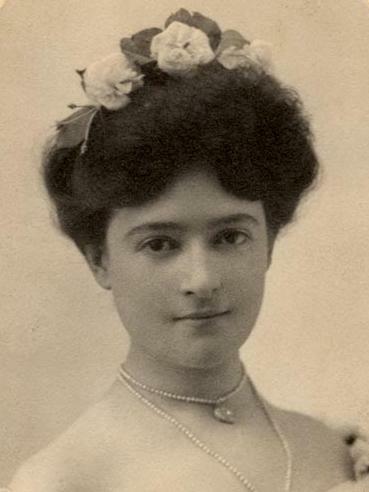 In 1903, when the De Zavala group heard that the long barracks might be sold to a hotel syndicate, Adina De Zavala sought the help of Clara Driscoll a nineteen-year-old heiress who had returned to San Antonio after several years studying in Europe. She was so appalled at the condition of the Alamo that she wrote an article for the Daily Express calling the Alamo complex an “old ruin…. hemmed in on one side by a hideous barracks-like looking building, and on the other by two saloons.” Clara Driscoll joined the De Zavala chapter of the DRT and went with Adina De Zavala to see the grocer who was asking $75,000 for the structure. 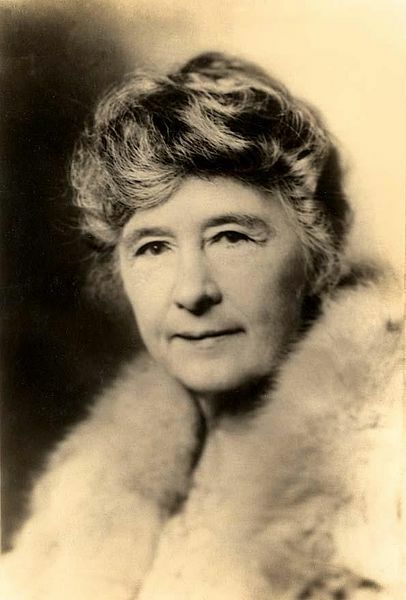 Clara Driscoll personally gave the owner $500 for a thirty-day option and the ladies set about raising the purchase price. Despite a nationwide campaign and a legislative appropriation, which was vetoed by Governor S.W.T. Lanham as “not a justifiable expenditure of the taxpayers’ money,” Clara Driscoll eventually paid $65,000 to complete the purchase. Over the governor’s objection, the state reimbursed Clara Driscoll and gave custody of the property to the Daughters of the Republic of Texas. Then, cracks began to show in the bulwark of the organization as members divided over what should be done with the grocer’s building. Adina De Zavala and her cohorts believed “a large part” of the original convent/long barracks played a significant role in the Battle of the Alamo and remained hidden under the grocer’s building, while Clara Driscoll and her camp believed the walls of the convent/long barracks overshadowed the Alamo chapel and should be replaced with a dignified park. Members of the statewide DRT and citizens in San Antonio and Texas divided into De Zavalans and Driscollites, each faction determined to have its way. The two groups within the DRT separated from each other and when Clara Driscoll was given custody of the vacant grocery in 1908, Adina De Zavala locked herself in the building for three days as newspaper reporters from around the country gathered to watch the spectacle. 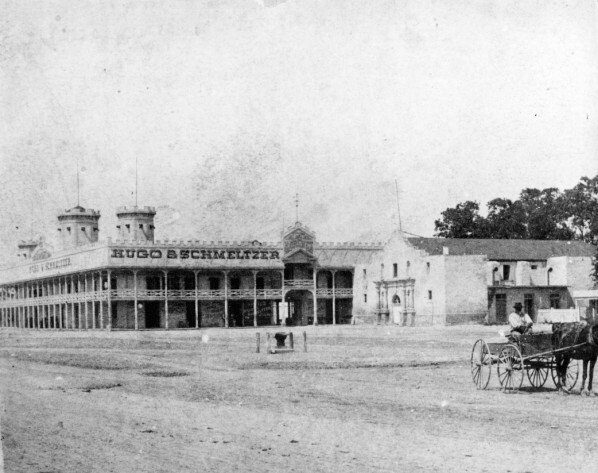 By 1910 the Driscollites seemed to have won the war, but one more battle remained: Governor Oscar Colquitt, deciding that walls under the modern grocery building pre-dated the Battle at the Alamo, ordered restoration of the convent/barracks. In January 1912 as the modern additions were removed, the governor personally watched the process that revealed arches and Spanish stone work, which confirmed the De Zavalans’ claim. However, the following year, while the governor was out of state, the lieutenant governor permitted the roof and walls of the upper story to be removed. Fifty-five years later, just in time for the 1968 opening of HemisFair, San Antonio’s world’s fair, the old building finally received a roof and opened as a museum. Adina De Zavala continued for the rest of her life organizing groups that restored, marked and preserved historic sites. When she died in 1955 at the age of ninety-three, her casket draped with the Texas flag was driven past the Alamo one last time. She willed her estate to the Sisters of Charity of the Incarnate Word for a girl’s vocational school and a boys town. Clara Driscoll spent the remainder of her life devoted to historic preservation, state and national politics, civic and philanthropic endeavors. 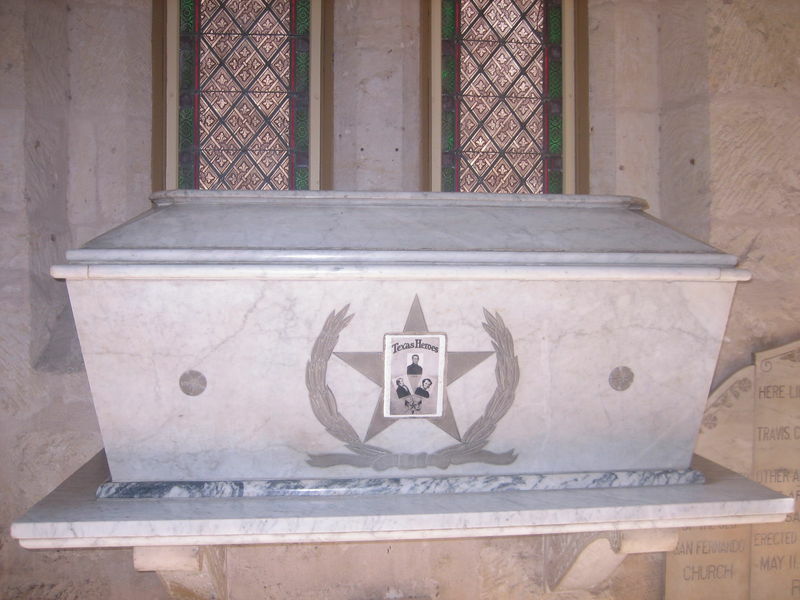 When she died in 1945 at the age of sixty-four, her body laid in state at the Alamo chapel. She bequeathed the bulk of her estate to the Driscoll Foundation Children’s Hospital in Corpus Christi. The Santa Cruz de San Sabá Mission, built in 1757, is the only Spanish mission in Texas destroyed by Indians. So thoroughly was the destruction that it took another 235 years for archeologists to finally confirm the site on the banks of the San Sabá River about 120 miles northwest of San Antonio. Construction of the mission was a dream of Franciscan padres in San Antonio who believed a mission in Apache territory would put an end to almost perpetual warfare with the tribes. Encouraged by a peace ceremony with the Apaches in 1749 and the Indians’ request to have a mission and a presidio to protect them from the Comanches, Spanish official sent three expeditions into Apache territory in search of a suitable site. Several factors influenced the choice of the San Sabá River valley, including its potential for irrigated farming and the concern that rumors of rich veins of minerals in the area might attract the French if the Spanish failed to establish a presence. Spanish officials, always concerned about the cost of every endeavor in its Texas province, finally authorized the new mission when religious ornaments and furnishings became available after the closing of three missions on the San Gabriel River. And, a wealthy mine owner agreed to fund the cost of up to twenty missionaries for three years providing that his cousin Fray Alonso Giraldo de Terreros be placed in charge of the new mission. With Col. Diego Ortitz Parrilla appointed commander of the San Sabá presidio, the march to the new site began on April 5, 1757. A total of about 300, including six missionaries, arrived on April 17th with 1400 cattle and 700 sheep. To their dismay they found no Apaches waiting to join the mission. In an effort to satisfy concerns of the padres who feared the soldiers would corrupt their Indian neophytes, Ortiz Parrilla selected a site for the presidio on the opposite side of the river and about two miles from the mission. By mid-June not a single Indian had come to the mission. Then, to the padres’ delight 3,000 Apaches who were heading north to hunt buffalo and fight Comanches, camped near the mission. After ignoring the missionaries’ overtures, the Indians left behind two of their group who were sick and promised to join the mission upon their return. By this time, three of the original six missionaries had given up and returned to San Antonio. With the arrival of winter, rumors circulated of northern tribes gathering to fight the Apaches and destroy the mission. The missionaries seemed unaware that despite Apaches never one time coming to the mission, it looked to the Comanches like the Spanish were siding with their bitter enemies. On February 25, 1758, after Indians stole fifty-nine horses, Parrilla Ortiz led soldiers in pursuit, only to find hostile Indians all over the countryside. Returning to the mission, he tried unsuccessfully to convince Father Terreros to move the remaining three missionaries and thirty-three others to refuge in the presidio. On March 16th as the mission went about its morning routine, 2,000 Comanches and other tribes that were enemies of the Apaches attacked the log stockade with some of the warriors using European guns at a time when most Indians fought with bows and arrows or hatchets. Father Terreros and seven others were killed, while one missionary and about twenty others escaped to the presidio. The attackers killed almost all the animals, including the cattle, and set fire to the stockade. The Indians moved on to the presidio and when they could not lure the soldiers outside the fortress, they departed on March 18th. After less than one year, the Santa Cruz de San Sabá Mission had come to an end. The Spanish government, determined not to appear weak to the Comanches, refused to close the presidio. In September 1759, Ortiz Parrilla was sent with 500 soldiers and Apache braves into Comanche country to punish the warriors for the attack on the mission. After several brief encounters Ortiz found Comanches and other tribes on the Red River in a village flying a French flag and surrounded by a stockade and moat. The Comanche had been warned of the Spanish approach and Ortiz suffered fifty-two dead, wounded, or deserted before he ordered a retreat. The Spanish government insisted that the San Sabá Presidio remain open despite the superior power of the Comanche and other northern tribes who had firepower similar to the Spanish. Many soldiers asked to be transferred and despite the presidio being rebuilt in limestone and surrounded by a moat, the soldiers were killed if they ventured out of the compound. In 1762 a painting, The Destruction of Mission San Sabá was commissioned. It is believed to be the first painting to depict a historical event in Texas. In 1769, Presidio San Sabá was finally closed, over ten years after the fall of the mission it had been built to protect. 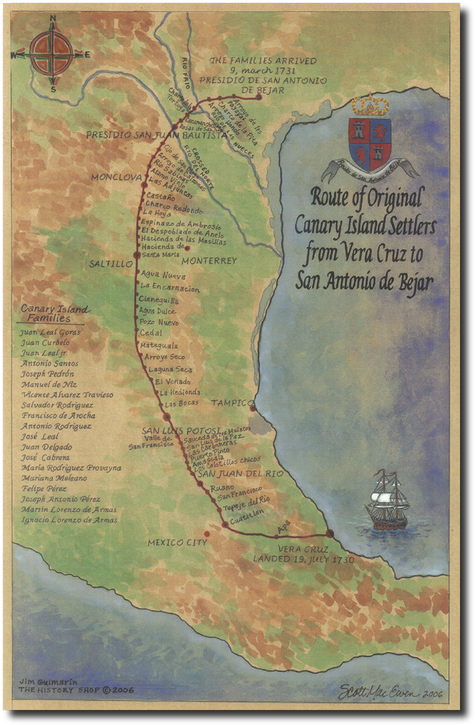 After the Frenchman René Robert Cavelier, Sieur de La Salle missed the mouth of the Mississippi where he planned to establish a colony and landed instead in 1685 on the middle Texas coast, the Spanish Colonial government became concerned about the French encroaching on Spanish Texas. The worry led to constructing missions in East Texas with the aim of Christianizing the Indians and establishing a buffer to keep the French in Louisiana from coming into Texas. After years of little success in converting the Indians and finally moving all the missions out of East Texas, the Spanish Colonial authorities realized that securing control of the vast area required more than missions and a military presence—civilians were needed to populate the province of Texas. By 1718 Mission San Antonio de Valero (present Alamo) and its presidio still lacked a civilian presence. stopped at places like San Luis Potosi and Saltillo where they received food and clothing. At Presidio San Juan Bautista on the Rio Grande they left their worn-out horses and continued their trek on foot to the banks of the San Antonio River. The journey of almost a year brought heartache, including deaths that left two widows as heads of large households and the three Cabrera children–Ana, José, and Marcos—whose parents died on the trip. Marriages along the way increased the entourage to fifteen families—fifty-six people—reaching their new home on March 9, 1731. Each family received generous land grants, including the three Cabrera orphans. They named their pueblo “Villa de San Fernando” in honor of the prince, Don Fernando, who became King Ferdinand in 1746. By August the Islanders, “Isleños,” had finished plowing and planting and had elected civilian officials to legally establish the first chartered civil government in Texas. Because of their position as the first civilian settlers, the Isleños had permission from the crown to carry the title of “hidalgo,” or son of noble lineage. For years they represented the political and socioeconomic elite of the community. Tensions arose between the three communities—the Isleños, the military in the presidio, and the Franciscans in the nearby missions—over access to water, which had to be delivered by acequias or irrigation canals, the use of the land, and the management of livestock. As continued harassment from marauding Comanche, Apache, and other roving tribes made it difficult for farmers to work in their fields and sometimes even cut off communication with authorities in New Spain, the lines of differences began blurring between the groups and a cohesive community emerged as they banded together against the outside threat. The Isleños laid the cornerstone in 1738 for the Church of San Fernando, the first parish church in Texas and completed its construction in 1750. Over the years the church was enlarged and in 1874 Pope Pius IX named San Antonio a diocese with San Fernando as its cathedral. 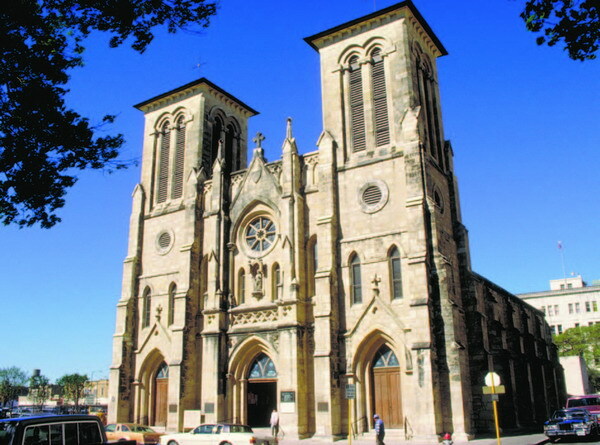 plays a major role in San Antonio as it continues to function as a religious institution while hosting symphonies, concerts, television specials, and the constant arrival of tour buses carrying visitors eager to see one of the oldest cathedrals in the United States that began as a parish church for Canary Islanders.